Active Touch System: The new Active Touch System fundamentally changes the way you receive and strike the ball, providing closer control, improved fluidity, creativity and increased player personality. Dynamic Tactics: A re-imagined system gives players the tools to set multiple tactical approaches, offering in-depth customization pre-match, as well as more options for dynamic in-match adjustments from the D-Pad. Each tactical approach combines formations, mentalities, and attacking and defensive play styles, enabling you to easily customize your play in any situation. Timed Finishing: Double tapping shoot on any strike attempt triggers a timed finish, putting users in control of how accurately they connect with the ball. Real Player Motion Technology: the game-changing animation system, which brought player personality and increased fidelity in movement to EA SPORTS FIFA, returns with increased coverage across the pitch. 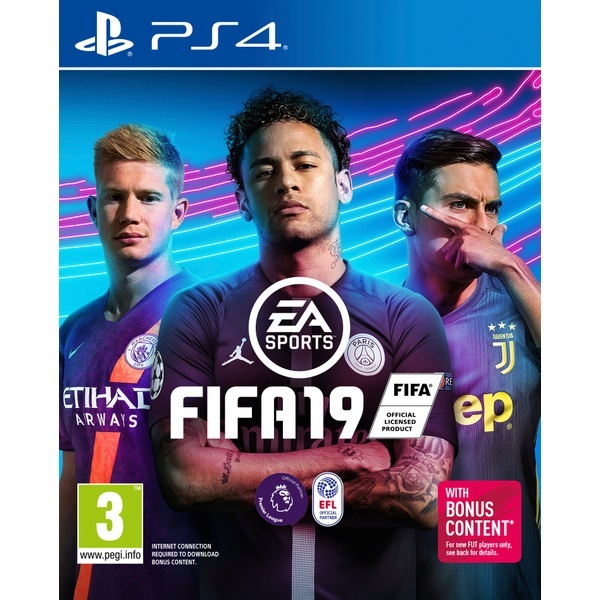 Modes: The UEFA Champions League, Europa League and Super Cup come to life across experiences in EA SPORTS FIFA 19. From a title chase in The Journey: Champions, to live content updates in FIFA 19 Ultimate Team, to authentic Kick Off and Creer Mode integration, to an all-new standalone Champions League Mode, you can experience the greatest club football competition in the world no matter where you play in FIFA 19. Build your dream squadrom thousands of players and compete in the most popular mode in FIFA. Featuring content from UEFA Champions League and Europa League, the world's most prestigious club competitions come to life with live content in FIFA 19 Ultimate Team.